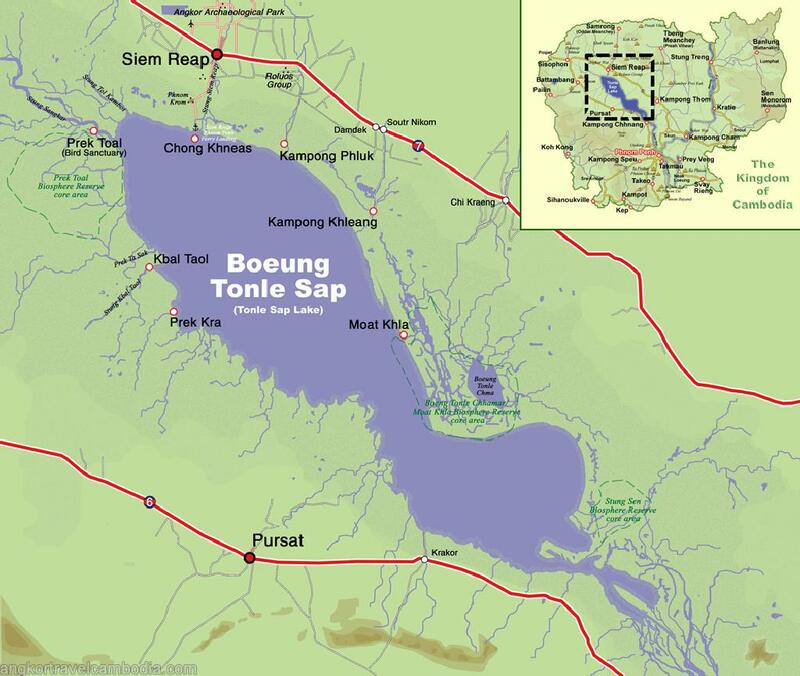 is the most prominent feature on the map of Cambodia - a huge dumbbell-shaped body of water stretching across the northwest section of the country. In the wet season, the Tonle Sap Lake is one of the largest freshwater lakes in Asia, swelling to an expansive 12,000 km2. During the dry half of the year the Lake shrinks to as small as 2500 km2, draining into the Tonle Sap River, which meanders southeast, eventually merging with the Mekong River at the 'chaktomuk' confluence of rivers opposite Phnom Penh. But during the wet season a unique hydrologic phenomenon causes the river to reverse direction, filling the lake instead of draining it. The engine of this phenomenon is the Mekong River, which becomes bloated with snow melt and runoff from the monsoon rains in the wet season. The swollen Mekong backs up into the Tonle Sap River at the point where the rivers meet at the 'chaktomuk' confluence, forcing the waters of the Tonle Sap River back upriver into the lake. The inflow expands the surface area of lake more than five-fold, inundating the surrounding forested floodplain and supporting an extraordinarily rich and diverse eco-system. More than 100 varieties of waterbirds including several threatened and endangered species, over 200 species of fish, as well as crocodiles, turtles, macaques, otter and other wildlife inhabit the inundated mangrove forests. 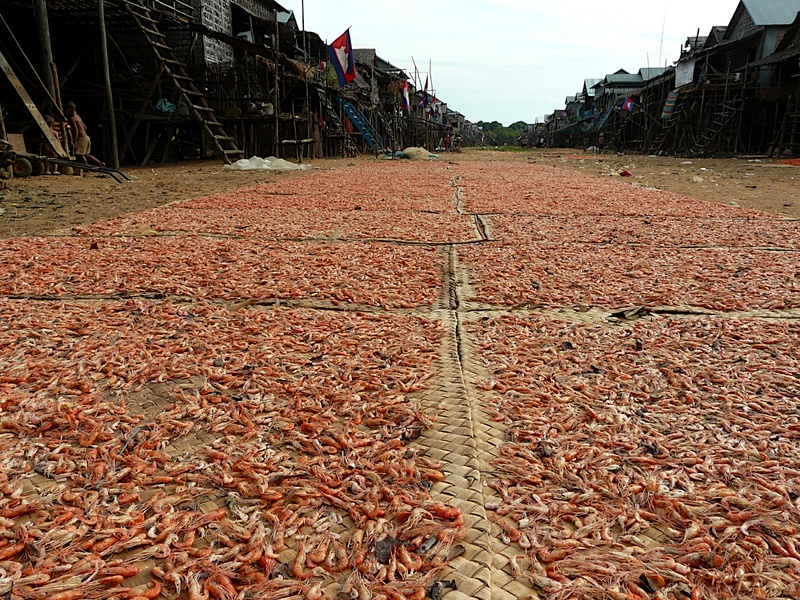 The Lake is also an important commercial resource, providing more than half of the fish consumed in Cambodia. In harmony with the specialized ecosystems, the human occupations at the edges of the lake is similarly distinctive - floating villages, towering stilted houses, huge fish traps, and an economy and way of life deeply intertwined with the lake, the fish, the wildlife and the cycles of rising and falling waters. 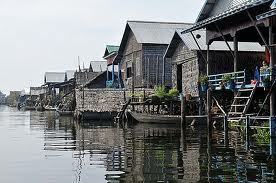 Chong Khneas is the floating village at the edge of the lake closest and most accessible to Siem Reap. If you want a relatively quick and easy look at the Tonle Sap, boat tours of Chong Khneas are available, departing from the Chong Khneas boat docks all day long. Take a motodup or taxi the 11-15km from Siem Reap to the boat docks where there are always boats waiting for passengers. A two-hour boat trip through the floating village runs $6 and the boats may carry as many as 15 other people if take private boat is 10 - $15 each.The boatman will probably point out the differing Khmer and Vietnamese floating households and the floating markets, clinics, schools and other boatloads of tourists. Chong Khneas, while interesting, is over-touristed and is not as picturesque and 'unspoiled' as floating villages further from Siem Reap. The boat trip usually includes two stops: one at a touristy floating 'fish and bird exhibition' with a souvenir and snack shop, and the other at the very highly recommended Gecko Environment Centre, which offers displays and information introducing the ecology and biodiversity of the lake area. Most people arrange a trip to Prek Toal through their driver or guesthouse tour operator To do it yourself, take a moto or taxi from Siem Reap to the Phnom Krom/Chong Khneas boat dock. Arrange a boat to the Prek Toal Environmental Research Station (starting at $50-$55 return,) and then from the Research Station a $5 entrance fee and $15-$25 for a guided boat tour of the sanctuary. The Research Station has information on the area's flora and fauna. There are also basic overnight accommodations at the Research Station if you want to stay the night to take full advantage of the sunset and early morning viewing hours.